Staffroom’s InTouch module is used for communicating with school staff and also people who are external to the school such as parents and caregivers. InTouch allows you to send emails or SMSes to groups of people that Staffroom knows about e.g. all parents of students in a particular grade, all of the school staff, or the parents of absent students. 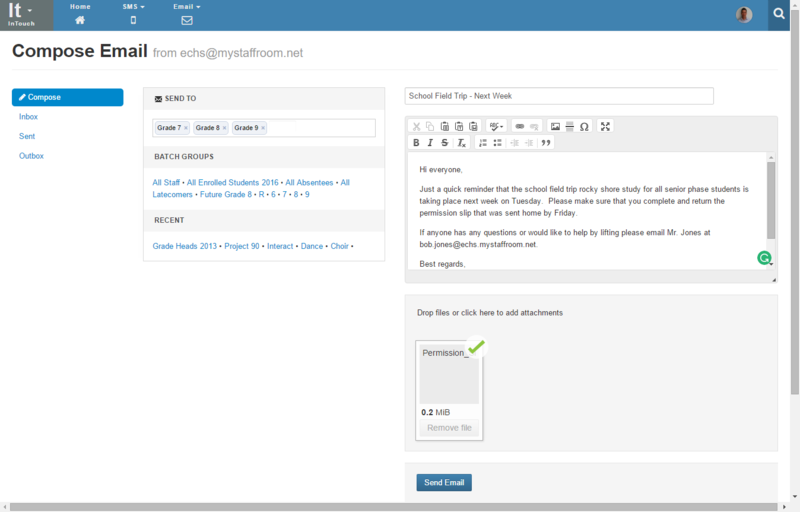 All emails and SMSes that are sent using the Staffroom InTouch module are visible on the student records in the Staffroom Infobase module. NB: Sending emails from Staffroom is free, however, sending SMSes does come at additional cost. Sending SMSes requires using a third party SMS gateway. You can find a list of supported SMS gateways here.